Lloyds TSB has unveiled its plans for a £12.2bn takeover of HBOS. Here are some of the important dates in the history of Lloyds TSB. John Taylor and Sampson Lloyd set up a private banking business in Birmingham. Their two sons followed in their footsteps by establishing a bank - Barnetts Hoares Hanbury and Lloyd - in London's Lombard Street. This eventually became absorbed into the Lloyds Banking Company. The origins of the TSB stretch to 1810, when the Reverend Henry Duncan of Ruthwell, Dumfriesshire, set up a bank to help his poorest parishioners save for times of hardship. It was such a popular scheme that by 1818 there were 465 savings banks in Britain (including 182 in Scotland). The Trustee Savings Bank Association (TSBA) was established to help the individual banks co-operate. Lloyds Bank (France) formed when Lloyds acquired Armstrong and Co, which had bases in Paris and Le Havre. A strong connection with South America began in 1918, with the acquisition of the London and River Plate Bank. Lloyds Bank expanded through a series of mergers and by 1923 it had made some 50 takeovers. After considerable growth for the TSB in the 1970s and 1980s, the remaining 16 savings banks gave up their individual identities to form TSB England and Wales, TSB Scotland, TSB Northern Ireland and TSB Channel Islands. The TSB floated on the stock market and launched Speedlink, Britain's first telephone banking system, the following year. Lloyds merged five of its businesses with the Abbey Life Insurance Company to create Lloyds Abbey Life. TSB England and Wales became TSB Bank plc, and the newly named TSB Scotland plc and TSB Northern Ireland plc became its subsidiaries. Allied Irish Banks bought TSB Northern Ireland. Lloyds took over the Cheltenham & Gloucester building society to expand its business in mortgage lending. 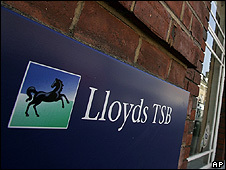 Lloyds Bank Group merged with the smaller TSB Group to form Lloyds TSB Group plc. Lloyds continued to expand, taking over the Scottish Widows insurance firm in 2000, although an attempt to buy the Abbey National bank the following year was thwarted by the Competition Commission. Lloyds TSB announced its plans for taking over HBOS, a deal which has still to be agreed by investors.